BLACKVILLE (GNB) – Southwest Miramichi Bridge No. 2, located on Route 118 in Blackville, will undergo $1.4 million in repairs during the next two years. Repairs will consist of placing permanent and temporary bracing on the steel box girders; replacing the concrete deck and expansion joints; and removing granite curbing and replacing it with new concrete along the sidewalks on both sides of the bridge. The contract was awarded to Vail Civil Contractors Ltd. of Fredericton. Traffic will be reduced to one lane throughout construction, with some full bridge closures lasting 48 hours during concrete placement. A detour will be established for the full closures. Signs and traffic lights will be installed. With the exception of school buses, truck traffic will not be permitted during construction. The detour will be about 30 kilometres, directing motorists north on Route 8 to Renous and then east (at Exit 139) to Route 108 toward Quarryville Road Crossing and Southwest Miramichi Bridge No. 1; then south on Route 118 to White Rapids/Grey Rapids and Campbell Road. “Motorists are advised to drive with due care and attention on the detour due to the additional traffic on secondary roads,” Williams noted. Built in 1972, Southwest Miramichi Bridge No. 2 is 154 metres (512 feet) long. 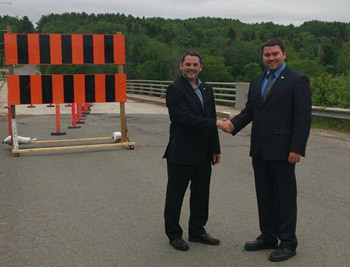 In addition to the bridge work, a $500,000-contract has been awarded to Springhill Construction Ltd. of Fredericton to pave 1.4 kilometres of Route 8 in Blackville from Hillcrest Avenue to Barnettville Road. The new section includes a paved shoulder along each side of the highway. In 2011-12, the provincial government invested $1.2 million in other improvements to Route 8.